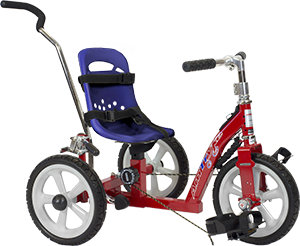 Amtryke foot trykes were developed in response to requests from therapists for a traditional tricycle for riders with special needs. We are very proud of this Early Intervention model - the 1410. It is the only tryke of its kind. Fitting both smaller and larger riders than previous models. Choose from a variety of seating options and accessories that help riders feel safe and secure.